Group portrait of Gami, a commoner governor of a province in the east of Gbduwe's old kingdom, surrounded by his family, with a line of sons to the right, daughters to the right, and wives and younger children seated. 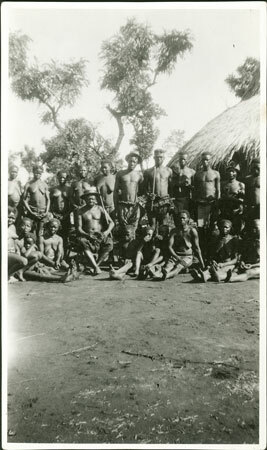 Sixth from the left is a son identified as Sianga. Notes on print/mount - "Gami & sons. Sianga sixth from right V-1 72/5 EPA725"
Notes on card mount m/s pencil - "Fading/ SSS upper/ RCS upper RHS (edge) 8.89"
Morton, Chris. "Zande governor and family" Southern Sudan Project (in development). 03 Jan. 2006. Pitt Rivers Museum. <http://southernsudan.prm.ox.ac.uk/details/1998.341.725.2/>.